In this post, you will learn how to clean up the trunk, hollow out a stump, and trim and wire the branches of the Olive Tree, scientific name Olea europaea. This tree has been growing in the same pot for over 4 years. Last summer, it was cut back very hard and as a result, it developed a fine dense branch structure that can be used to create a beautiful bonsai. This is a great material for bonsai, because it has a character: beautiful bark, natural deadwood and nice twist in the trunk. When you begin working on the material like this, it is not really important to know what exactly you want to make out of it. You just need to find parts of the tree that you want highlight. The key to creating an interesting bonsai is an understanding of how trees deal with damage, how they repair themselves and how they continue living for thousand years in spite of everything the environment throws at them. Here we have an English Hornbeam bonsai, also known as Carpnus betulus, that has an ugly cut in the middle of the trunk. A lot of bonsai enthusiasts wouldn’t know what to do with it. In this post, you will learn fast and easy fix for that kind of a problem. Looking closely at the cut, you can see that it is absolutely flat. There are also visible saw marks where the original trunk was removed. The scar has been healing for a few years now. The callus tissue has rolled back nicely and there is a sharp dry back around the edge. For those reasons, this is a perfect candidate to be hollowed out. The callus will gradually roll into the hollow that we are about to make and it will look very natural. Bonsai is the art of distilling the magic of an ancient tree into a miniature form that is pleasing to the eye. Nature give us limitless variety where no trees are alike. In order to create truly interesting bonsai we need to free our imagination and encompass the infinite wonder of the world around us. In this post, you will learn how to style a tree through branch trimming, wood carving and wiring. This Oriental Hornbeam, scientific name Carpinus orientalis, is a well established tree that has been in development for 7 years with 5 years growing in the same pot. You can see there are more than one problems that needs to be addressed. This tree has a lot of thick branches growing in different directions and a lot of dense twigging. Just by looking at it, its not clear where the front of the tree should be. Most of the beginners get their bonsai from a mall, home improvement store, or at the chain store. Commercial quality bonsai are produced on a mass scale in many countries including China and Japan. They are often lifted from the ground and planted into a bonsai pot. Many times they would sit indoors for a while before you buy them. As a result, those trees are in poor health, growing in poor soil with minimum styling. Most of the these trees die in the hands of novices. Those that don’t, tend to be poorly maintained and never really reach their full potential. Today you will learn how to turn a boring mass produced tree into an inspiring bonsai in just a couple hours. For these demonstration we’ll be using Kishu Juniper bonsai. Bonsai trees need to be repotted on the regular basis, otherwise as the tree grows, the pot will get filled with long roots. When this happens, the drainage in the soil becomes worse and worse, and the vigor of the tree will gradually begin to decline. The tree will not be getting enough nutrients and as a result the health of the tree will begin to suffer. Repotting is one of the those things that beginners fill uncomfortable doing, because cutting roots of the tree doesn’t seam to be a natural thing to do. Some people are even saying that bonsai art is about tree torturing. That couldn’t be farther from the truth. This Crabapple Tree, also known as Malus sargentii, was collected a year ago. 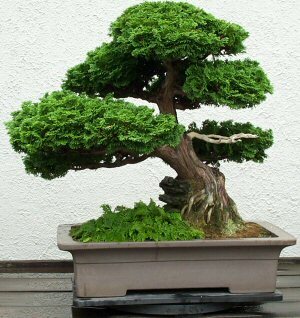 In this post, I will show you how to air layer this tree to create a bonsai. Air layering technique is one of my favorite, because it saves you time and money. You can select the part of the tree that would make the best bonsai composition. In this tutorial you will see how to transform an ugly hedging material to a beautiful bonsai by using a deadwood carving techniques and some branch wiring. We’ll be using Privet Tree, scientific name Ligustrum ovalfolium which is a plant that is widely used for hedging. It has been in this pot for about 4 years. During that time, it has been pruned very frequently resulting in a dense branch structure. Natural habit of this tree is very long and straight branches. In order to create a bonsai from it, we’ll need to do some wiring. This large Buttonwood Tree, scientific name Conocarpus erectus, has been growing for about 10 years. Since the trunk looked weak, it was placed over the rock to give it more support and to create root over rock style. There are a few new roots that are growing over the rock making this composition more balanced. In this tutorial you will learn how to style and clean up this bonsai. In this repotting tutorial you will learn how to repot a Moreton Bay Fig, scientific name Ficus macrophylla. This bonsai was sold in a nursery pot and needs to be repotted into a bonsai container. Many beginners think that bonsai is this little cute indoor plant. They couldn’t be farther from the truth. Bonsai are naturally outdoor trees that are grown in small containers. And like regular trees they need to grow outside. Some of the tropical or subtropical species need protection from cold and can be brought inside during winter months, but even they should be taken outside when the weather is warm. In the magazines and books you will see photos of bonsai that are taken indoors. Understand, they’ve been brought inside temporary for the photo shoot or bonsai show and will be returned outdoors for recovery. Deciduous and coniferous trees should be grown OUTDOORS for a few reasons. First, climate trees need a period of rest, or you can also say “dormancy”, during cooler season. That is when trees stop growing and start saving all their energy for Spring. It is VERY important for the trees to have that rest period. Without it they will be forced to continue to grow and then will go into a forced dormancy which can be DEADLY. Bonsai can be overwhelming especially for beginners. There are so many techniques, rules and varieties of trees available today, that it is easy to get lost. If you are new to bonsai and don’t know where to begin, start by learning how to keep your tree alive and take care of it. After learning the fundamentals of bonsai, you can try more difficult techniques. Most of the beginners get their first bonsai from a shopping mall or a large home improvement store like Home Depot. Some get it as a gift, which was also probably purchased at the mall. Very few get it from a reputable bonsai nursery. I can’t even call those inexpensive plants a bonsai. Air layering is a way to propagate the tree without growing it from seed or cuttings. Air layering is when you take a tree that is already established, remove part of the bark and surround it with peat moss. After a while, the roots will develop in that location allowing you to separate that part of the tree and plant it separately. This method is great not only because you can get a new tree to establish pretty quickly, but also because you can choose the best part of the tree for your bonsai. A lot of times you’ll find a tree that has a great movement and curves at the top and you know that this top part would be perfect for bonsai. With air layering you can take just that top part and grow it independently creating a beautiful bonsai. In the nature, trees are able to extend their roots deep into the ground to get water, air and nutrients. Since bonsai grow in small pots, they need to get all the water, air and nutrients from the little amount of soil. It would make sense to use the same kind of soil that trees grow in. Unfortunately, potting soil has multiple problems when used for bonsai. It locks too much moister, has poor drainage and is too compact for the oxygen to get in. Most of the bonsai masters use soil mix that consists of fired clay, river rock and some organic component like pine bark. It might shock you, but there is NO SOIL in a good bonsai soil mix. This soilless mix is designed to provide trees with fast drainage, good aeration, and high water retention. 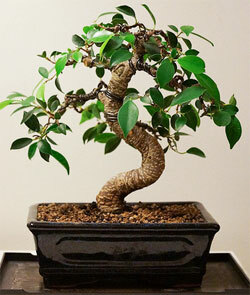 A wiring technique in bonsai is used to better control and manipulation the structure of the tree. We use wiring to fill in bare spots of the tree, create a movement or simply to change the direction of the branch. It would be very hard, and sometimes even impossible, to create a bonsai that we want without using a wire. Correct wiring is almost an art form in itself and takes a lot of practice to get it right. If the tree is wired nicely, you can display it without wire being an issue. You need to consider few things when choosing a bonsai tree. First decide where you are going to put your bonsai tree, whether you would like to grow it outdoors or indoors. This will directly determine your choice of bonsai tree. A lot of people think that bonsai are houseplants but most of the bonsai are hardy trees and cannot live indoors. Imagine digging out a maple tree from your yard and bringing it indoors. I will not survive for long. Bonsai maple is just a smaller version of the real tree.